For a man who has achieved so much Sanduk Ruit is down-to-earth and humble about his accomplishments. Much has already been said about Sanduk Ruit, pioneer eye surgeon and Magsaysay Prize winner who has done Nepal proud. He developed an affordable surgery technique to enable tens of thousands of underprivileged people around the world to see again. The story of Ruit’s life is an inspirational one, of a young boy from one of Nepal’s remotest areas who showed what hard work, determination and vision can achieve. This story is specially relevant at a time when Nepalis are fighting for privileges based on ethnic origin, forgetting the principles of meritocracy. Born in Olangchungola in the northeastern corner of Nepal to a life of extreme hardship, Ruit was soon boosted by the will to do his best to help people. After attending school in Darjeeling and Kathmandu, he started his medical studies in Lucknow. 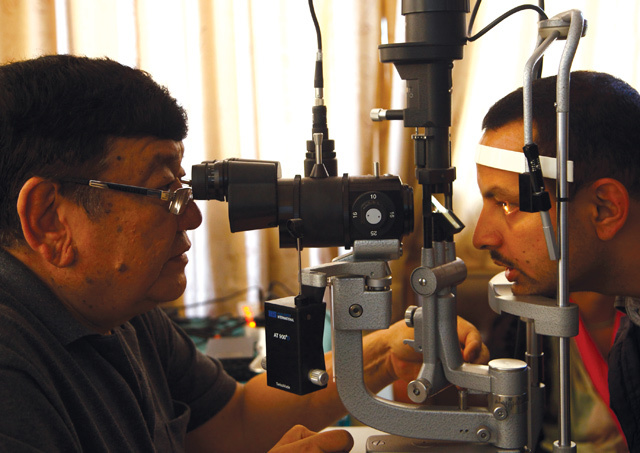 When Ruit returned, he worked as a general practitioner at the Nepal Eye Hospital where he understood that curing eye disease could improve people’s lives. He decided to specialise in ophthalmology in New Delhi. “I saw the poverty and understood the need of Nepalis,” he explains. He started looking for cost-effective ways to make people who had gone blind due to cataract see again. Ruit, who believes in destiny, says he was lucky to meet ‘interesting people’ who helped him in his mission. It started with Fred Hollows, a New-Zealander Australian doctor. “We started dreaming over a glass of whisky in 1985,” Ruit recalls. For six years Ruit toured rural areas of Nepal with a team of doctors and implemented the revolutionary and inexpensive cataract surgery technique that he had perfected with Hollows. This affordable operation which enables prompt recovery was going to change the lives of tens of thousands of patients who had lost their sight. Tilganga Institute of Ophthalmology (TIO) was then opened in 1994 in Kathmandu and today performs 40,000 surgeries a year. It now has community eye centres in 14 districts, and Ruit even goes to Ethiopia, Tibet, Cambodia and North Korea to organise eye camps. After the 25 April earthquake Ruit led a group from the TIO in various affected districts of Nepal to provide shelter, food and emergency medical treatment with funds raised in Nepal and abroad. Most recently, Ruit is working with Pilachhen Conservation to restore several heritage sites in Kathmandu that were destroyed during the quake. On the frontier, hearts and minds are different from those in the hinterlands in either direction. Dont laugh. The future is in cow dung. Biogas is already producing as much power as a medium-scale hydroelectric plant, and we havent even begun to scratch the surface. Going down to basics: why income tax?